When Christie’s June 2009 20th Century Design auction only featured three works by Tiffany Studios it left many wondering if they were holding back major Tiffany lamps for the more desirable fall sale season. 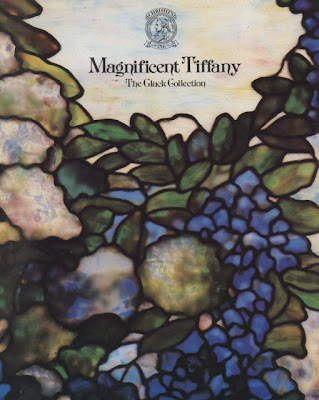 I must say when Christie’s announced that their December 8th “Magnificent Tiffany” sale would feature a selection from the fabled Gluck Collection I was more than intrigued. The first component of this legendary sale goes back some 30 years. Eugene and Eleanor Gluck amassed the bulk of their Tiffany glass collection in the 1970s, most of it through Lillian Naussau. Lillian was a tour-de-force art and jewelry dealer who had the foresight to snap-up Tiffany lamps during the heady post-war years. At that time, most Americans, seduced by the cool sleekness of Formica and new modernist construction, viewed Tiffany lamps as garish and Victorian, sending them to the thrift shop or the rubbish heap. After Eugene Gluck passed in 1978 the family opted to sell a large part of their collection and the sale became a benchmark of the expanding Tiffany market. The sale marked the first time a Tiffany lamp exceeded $100,000 at auction and this happened three times that day. A small and exceedingly rare “cobweb” lamp made $150,000, a larger “cobweb” fetched 125,000 and a delightfully saturated “wisteria" achieved $120,000. The sale was magic and blurred the perception between “decorative art” and “fine art”. Today a Gluck provenance easily commands a higher estimate right out of the gate. Now that the history lesson is over, the current Christie’s sale offers what appears to be the remainder of the Gluck collection coming in at a mere ten lots, only two of which are worth writing home about. The Gluck section opens boldly with a vibrant 22 inch “peony” lamp and a few lots down the line we get to a delightfully aquatic toned “conical dragonfly” shade on a conforming mosaic base. There is one other lamp, a less desirable geometric, and the rest are a tasteful but lesser array of Tiffany glass and bronze table articles. But hey, with that provenance everything in the section should do quite well. In spite of the economy, Christie’s managed to amass a good-looking sale overall but I am puzzled by one decision. They opted to place four 22 inch “peony” lamps in one sale. It seems like a bit much, but they actually make a good object study for the novice. Individual Tiffany patterns are built on the same “mold” but it is always the glass selection that makes the true difference. They put these lamps in the sale by order of quality, and thus, estimate. The Gluck example (a rarer variant and hands down the best) is up first at lot 11, the next (in succulent reds) is lot 41, and the remaining two are lots 46 and 47. As you look at them in order notice how the first two examples have a mottled and brooding tonality achieving a sense of depth and movement. Contrast that with lots 46 and 47 and you see how the lesser examples of the “peony” really begin to flatten out into something that is “pretty” but lacking in intensity. Lets hope that Sotheby’s doesn't offer any peony lamps of this size, who knows what the market will bear. Tiffany has shown itself to be a strong performer over the past year, but personally, I would not want to sell my “peony” when there are already four others in the mix. You definitely split your chances at achieving an aggressive price, unless yours is the very best (Gluck).